Note: If your binary is instrumented with Mudflap, you can't run Memory Analysis on it because there will be a conflict trying to overload the same functions, which will make the program crash. Open or create a launch configuration and select the Tools tab. Click Add/Delete Tool at the bottom. 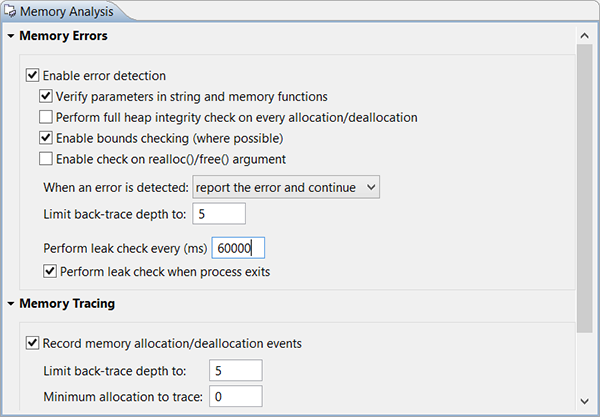 In the Tools selection dialog, check the Memory Analysis box and click OK.
On the Memory Analysis tab that now appears in the launch configuration, expand Memory Errors. Using the first four checkboxes under Enable error detection, specify the types of problems you want to look for. For information about these error check controls and the other UI fields that control what data appears in the analysis results, see Configuring Memory Analysis sessions. If you want the IDE to display the QNX Memory Analysis perspective whenever you launch the application, check Switch to this tool's perspective on launch, below the Memory Analysis tab. Click Run or Debug to launch the application. As your application runs, the Memory Events and Memory Problems views display the analysis results. For details on using these views, see Interpreting Memory Analysis results. You can also adjust the Memory Analysis settings for the running application through the Settings tab of the editor.